(FNA)- Iraq’s military offensive to liberate the city of Mosul from ISIL’s control continued on Sunday as reports said Iraq’s joint military forces managed to seize back the ancient city of Nimrud 30 kilometers to the South of Mosul. Iraq’s joint military forces managed to seize back the ancient city of Nimrud 30 kilometers to the South of the city of Mosul. “The Iraqi army’s Ninth Armored Division inflicted heavy losses on the ISIL terrorists after taking full control of Nimrud ancient city and its surrounding areas,” senior Iraqi Commander Major General Abdel Amir Yarallah said on Sunday. Iraq’s joint military forces are now in full control of the ancient city. Commanders of popular forces in Iraq lashed out at the US-led coalition for hindering the operation to fully liberate Mosul. “The popular and resistance forces are not pleased with the US-led international coalition’s presence in Nineveh operations since they do not coordinate operations with the popular forces in the Western front,” Spokesman and a senior commander of Iraq’s Kata’ib Hezbollah (Hezbollah Battalions) popular forces Jafar al-Hosseini told FNA on Sunday. He said that the popular forces have called on the government to exclude the US-led coalition from the Western front. Iraq’s joint military forces continued to move ahead in several directions inside Mosul and seized back several more districts Southeast of the city, while the ISIL has resorted to dispatching female suicide bombers to war fronts to prevent the army’s further advances. “The Iraqi forces entered the Eastern flank of the city from the Southeastern side and purged terrorists from al-Entesar, Jadideh al-Mufti, al-Shima, al-Salam and Youness al-Sabawi regions as well as all the villages located to the North of al-Zab river,” Senior Iraqi Commander Abdel Amir Rashid Yarallah said on Sunday. ISIL attacked a village in the Central Iraqi Salaheddin province with the shells of chlorine gas, killing at least three people, a local source reported. The source said terrorists fired at the village over 15 mortar shells containing chemical chlorine, Al-Sumeriya reported. “The ISIL attacked a village in Al-Shirqat region with more than 15 mortar shells, some of those containing toxic chemical chlorine. As a result of firing three people were killed, two were wounded, among them women and children. Material damage was done, as well,” the source further added. Commander of ‘We Are Coming Nineveh’ Military Operation Najm al-Jabouri said the ISIL has ordered its militants to withdraw from their positions to the center of the city of Mosul. “The advances made by the Iraqi forces from several directions have resulted in ISIL’s withdrawal to Mosul city center,” the Arabic-language media quoted al-Jabouri as saying on Sunday. The commander said that ISIL’s withdrawal order came from fear of confrontation with the Iraqi security forces. He noted that Iraq’s joint security forces are forcefully and rapidly advancing towards towns located to the East and North of Mosul city. Forces of Iraq’s Counter Terrorism Service (CTS) purged ISIL militants from two districts in Eastern Mosul and began advancing in a third neighborhood. CTS commander Lieutenant-General Abdul Wahab al-Saidi made the announcement, while adding that 30 militants were killed in the process, presstv reported. He said that Iraqi forces are now fully in control of the district of al-Arbajiya and are currently halfway through purging the adjacent al-Qadisiya al-Thaniya district. 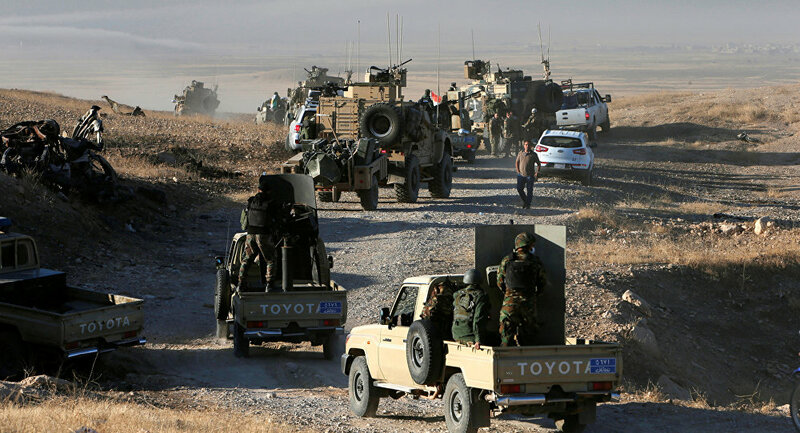 (FNA)- Deputy Chief of the Nineveh Provincial Council Noureddin Qablan announced that the US-led coalition warplanes have launched airstrikes on on army base in Nineveh province, killing several soldiers. “The US fighter jets hit one of the military bases of Iraqi Army’s 16th Division in a region North of Mosul, and the attack left four Iraqi soldiers dead,” Qablan said. He said that the US army has confirmed the attack, calling it a “mistake”. On October 5, the US warplanes hit the military positions of Hashd al-Shaabi forces in the village of Kharaeb Jabr to the South of Mosul, killing 20 Iraqi volunteer forces and injuring five others. In late September, a senior Iraqi lawmaker disclosed that the US fighter jets had pounded the military positions of the Iraqi volunteer forces in the Northern part of Babel province. “The Iraqi warplanes struck the equipment warehouses of Hashd al-Shaabi in al-Nasr region in Northern Babel,” Mohammad Naji said. He noted that the US was trying to prevent the Iraqi popular forces from making advances against the ISIL and the most important proof to that is that it struck Hashd al-Shaabi’s warehouse in mid-September. In June 2015, Fighter jets of the US-led coalition against ISIL once again struck the Iraqi forces’ positions in the province of Anbar, in Western Iraq. The US-led coalition warplanes hit the bases of Iraqi army’s Hezbollah battalions in Fallujah in Anbar province, killing 6 soldiers and injuring 8 others. In early May, the anti-ISIL coalition forces struck the position of Iraq’s popular forces near Baghdad, killing a number of volunteer forces. The US-led coalition warplanes hit an arms production workshop of the popular forces near the Iraqi capital, destroying the workshop and its ammunition completely. Two members of Iraq’s popular forces were killed in the attack. The US has repeatedly struck the popular forces’ positions in different parts of Iraq. On March 29 2015, the US fighter jets struck the positions of Iraq’s popular forces during their fierce clashes with ISIL terrorists near Tikrit, injuring a number of fighters. In January 2015, al-Zameli underlined that the coalition is the main cause of ISIL’s survival in Iraq. Over 80,000 troops are involved, including engineers and logistical support, in the operation to liberate the city of Mosul in Iraq from the Daesh terrorists, according to media reports. Tens of thousands of troops are involved in the operation to liberate the city of Mosul in Iraq from the jihadist group Islamic State (ISIL or Daesh), media reported on Monday. Over 80,000 troops are involved, including engineers and logistical support, in the operation, The Washington Post reported, citing a commander of Iraqi special forces, Maj. Salam Jassim. Mosul, the second biggest Iraqi city, is the main stronghold of Daesh in Iraq. The city was seized by Daesh, a jihadist group outlawed in Russia, in 2014 along with a number of other northern and western Iraqi cities and towns. Late on Sunday, Iraqi Prime Minister Haider Abadi announced the start of the military operation to retake Mosul from Daesh militants. Iraqi troops and their allies, including local Sunni militias, and US-led coalition support are involved in the offensive.